The internet has completely changed the way property buying is handled. Homeowners are no longer restricted to their local estate agency. Nowadays, it is possible to drag up information about potential homes from all around the world in the matter of just a few clicks. Increasing the selection isn’t the only benefit to be had from the internet, though. Embracing technology can improve the entire process in a long list of different ways. The internet is one of the most important tools at your disposal. Don’t underestimate its possibilities. 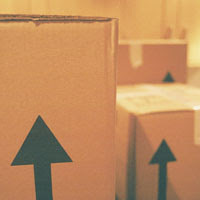 Here are just four ways that the internet can make the process of moving much easier. The first way that the internet can aid the moving process is that it opens your options. Even better still, you can access the information all from the comfort of your own sofa. In addition to showing you properties from all around the world, home builders can allow you to filter your results. This means that you only see the options matching your criteria. By erasing unsuited homes, you will have more time to study the genuine contenders properly. The internet expands your options while also reducing wasted time. You can’t say fairer than that. Your new property isn’t the only factor that needs to be considered. A lovely house in a bad area does not make the perfect home. The internet is a wonderful tool for researching new neighbourhoods. It’s not only the safety aspects that you can judge either. The internet allows homebuyers to look at career prospects, local schools and the general cost of living. Depending on your situation, this may narrow your search without having to waste days walking around various locations. You are still advised to check out any potential area with your own eyes, but this is a great first step before making any commitment. You might find the perfect home in an idyllic location. However, it is almost guaranteed that some changes will be required in order to stamp your personality on the property. The internet is a great resource for DIY tips, and also provides a huge shopping arena to source products cheaply. After spending such huge funds on the home itself, any extra savings are gratefully received. Admittedly, you won’t notice the rewards of this one until after the move. However, you can still research potential ideas to help get your creative juices flowing. Getting value for money is always important. When it comes to purchasing something like a house, it is imperative. A quick internet search of local properties will flag up any issues, which could save you a lot of hassle and money. Moreover, there are also some great online tips when it comes to haggling with an agent. The internet is a truly wonderful tool and you should look to make the most of it when moving home. If you do, it will reduce the stress of moving and help you locate the perfect home quickly and effectively.